Some ten years ago I suffered a bad case of ‘Tennis Elbow’ – aka lateral epicondylitis - due to a repetitive strain from cutting large quantities of carbon fibre when building ocean racing yachts. Extensive, and slow, physiotherapy over a course of ten weeks finally cleared it up and I took notice of the advice of the physiotherapist regarding how to avoid a repetition. Now it is back and worse than before. For ten days the tendon on my left forearm where the muscle joins the bone at the elbow had been feeling like it would immediately after being hit very hard with a hammer. After some ultrasound scans and a cortisone injection last Monday it now feels as if it was hit very hard with a hammer a few days ago; so, a slight improvement. The doctors say it will improve more over the next two weeks and then we will see if I need more physio again. So, the question is, how did it happen? In the few days before it occurred I had not been doing anything unusual or strenuous to the elbow and had not accidentally hit it either. BUT…..I have been working hard on practicing ‘la pompe’ and in recent weeks I had considered I had made some significant steps forward in co-ordinating the right hand with the left and the repetitive movement of the grip of the left hand alternating between holding a chord and lifting off to damp it. Could I have been overdoing it? Is this a risk with this style? Has anyone else experienced similar? Or am I just being too heavy handed and doing it wrong? Anyway, there is definitely NO guitar playing over at Martin Towers for now until I get the all clear from the physio, but should I now think about giving up on the GJ ‘pompe’ altogether? I had to stop playing gigs for many years due to repetitive strain . I have to say that when I started up with the Django stuff it became way worse until I just simply couldn’t play anymore. In retrospect I should’ve just stopped playing at the first signs of trouble and took a lot of time off. My desperation to just ‘ Play through it ‘ was a huge mistake. Now days when things act up I just take a week or two off . I really identify with what you’re going through . There so many things I tried the list would be a mile long . I really hope you can find something that works for you . It’s really about dealing with inflammation in my case, and probably with most all repetitive strain injuries . I am a serious tennis player, former teaching pro and I recommend immersing your elbow in ice water 10-15 min., twice daily. Consume lots of tropical fruit as vitamin C aids recovery. I had tennis elbow so badly that it hurt just to take the racquet back, let alone hit the ball. I was on a long vacation in Mexico, eating lots of mangos, and soaking my elbow in ice WATER and within a few days my elbow was much better, with no problems since. Last year I had a pinched nerve somewhere in the shoulder area just a week before Django in June. Non stop pain. I thought my week there will be spend as observer. Of course I couldn't resist but to take out the guitar and play when I got there. Low and behold la pompe ended up being therapeutic for it. As soon as I stopped, the pain was back, go back to pomping and 90 percent would disappear. And over the course of the week it got better too. Took at least a few months to completely go away but it was manageable after the week at DiJ. Nuts. A doctor I only talked to when it started said if I find something that helps, to just keep doing that. So I obligated. 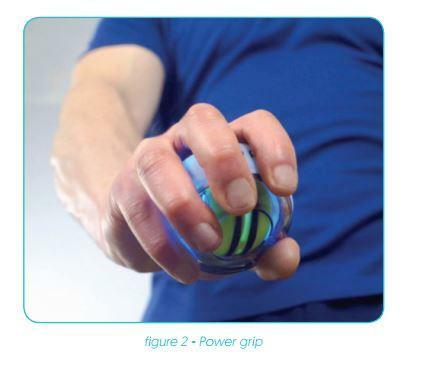 Chris, these gyro ball gizmos really help me whenever I feel a pain in my wrists. The word is it works on tennis elbow issues too. It's a learning curve to get them going at first. If I notice something going on, I just spin it a couple of times a day for a few minutes at the time. Gets better within days. I have had a lot issues, even before starting to play GJ. I was playing a lot of guitar, constantly typing and playing keyboards and was still occasionally teaching and playing tennis...arm was not good. I got a Thera-Band....learned some exercises for tennis elbow but initially before doing this stuff found a real good deep tissue massage guy (I initially thought it was Voodoo) who used to travel with Kobi Bryant and Chris Paul afterwards and that really worked. I had went to the doctor before this, tried cortisone shots and rehab and none worked...what did was what I mentioned, no drugs except occasionally an Alleve to cut inflammation. I had days when my arm was hurting a bit and I played La Pompe on a gig and the pain was gone, but I have also had the opposite happen, i'm fine play a gig and the next day my arm hurts a bit...maybe its called getting old. You are almost certainly stiffening somewhere where you shouldn't. Check list starts at the neck and takes in every joint on the way to the plectrum. People will gladly sell you gizmos and medical solutions, and you will find that noone who recommends them has resolved their problems. They are a distraction from taking responsibility for the fact that musicians create their own problems. Play in front of a mirror which takes in you whole body and let yourself notice all the weird things you do, then do nothing, just notice and your subconscious might fix it. I never have pain or discomfort because a long time ago I took full responsibility for them. I don't like owning things which are useless or shirking my responsibilities to my body. I can't see it catching on, too many proud owners of snake oils recommending them. Just because something can be legally sold does not mean it is anything other than absolute horsesh!t. Guitar takes very little strength, getting better generally means using less. All the best Chris, be patient and maybe keep a diary, it is easy to lose track of cause and effect if we trust our memories to much. Are you talking about Tennis Elbow--pain on the outside of the elbow--or golfer's elbow--pain on the inside? Either way, the treatment is the same: self or aided massage in the pain area, ice & NSAID's when really painful, rest, and a strap brace to take some strain off the tendon. Check out some YouTube videos from reputable physical therapists and you'll find that it's pretty straight forward. I've occasionally suffered from it myself as I am right now. Not sure how I get it to flare up, but I've been practicing and gigging more lately and may sometimes fall in to a bad posture or position habit. I'm always checking myself in practice for tension in my wrist, arm, and shoulder. La pompe requires some muscle strength, and it's likely that your muscles aren't strong enough yet, but that shouldn't be causing an injury in itself. The muscles should simply be getting tired, like when you're squeezing a rubber ball. The injury is almost certainly caused by using your body in an unhealthy way. It should be more widely appreciated how difficult it is to play a GJ guitar, particularly in its classic position. It's considerably lower and to the right than it would be its most ergonomic position. Looking at videos of top players, most of them seem to tilt their torso forward at the waist and rotate it slightly to bring their hands in a good position with respect to the guitar while maintaining a healthy posture from the waist up. This is hard to do. Even a "natural jock" like Stochelo seems to be playing with a slouch in recent years, and I hope this isn't causing him problems. I quickly realized I couldn't pull it off, so I came up with a more comfortable way to hold the guitar (on my left knee with an Oasis support cushion). Of the different unhealthy things one could do with a guitar, some are easier to self-diagnose than others. If you have a static tension somewhere, that should be easy to discover by introspection. If you're holding your wrist joint at an unhealthy angle, that's easy to figure out too. I injured my wrist a couple of times that way, and immediately fixed the issue, so the pain went away the next day and didn't come back. Misalignment of elbow and shoulder joints is somewhat harder to figure out, but also possible. Unfortunately, there are problems that arise from overall bad posture which manifest themselves in unexpected way. If you get stuck, I suggest you get in touch with an Alexander Technique instructor. An experienced one will be well-versed in the different ways musicians injure themselves. To give an example, I recently developed shoulder pain while playing guitar. An AT teacher quickly pointed out that when I wanted to bring myself closer to the fretboard (e.g., to put my thumb on the back of the neck without straining my wrist), I stuck out my head forward a little bit. This is typical of the counterproductive things that people who aren't naturally well-coordinated tend to do when faced with an activity that requires tricky full body coordination. When I focused on tilting my torso while keeping my neck at a natural angle, the pain went away. I doubt I would have been able to figure this out myself even with the help of a mirror. Here are a list of things which do not have the same meaning. A few lessons, twenty years study. Have you wondered Chris that a more arcane and bracingly priced plectrum could be a solution ? Yeah Score, deep tissue massage is the real deal for sure. Chris - I have this occurring on a periodic basis, which indicates my form is way off. Obviously, your medical professional is going to give you the best advice, but IF this occurs, you should stop. The worst time it happened was a few days before DiJ the last time I went. I basically was an observer. I took some classes but participated in very few jams and followed the advice of one of the instructors who basically said that this is a time to break down what you are doing and practice correctly. Playing through it might work for other folks, but it may not work for you. If I've gotten it, the pain lasted about 2 weeks and then its taken at least another 2-6 weeks to get back to where I was through careful measured practices. I've had some success with devices intended to get the tendon moving and with deep tissue massage, but it all needs to come back to your playing. It is extremely difficult to train the body to identify tension and relax, especially when you are excited about something and want to make it happen. However, measured practice with steady breaks and playing with little to no tension is the key. It also doesn't sound good either. Had a gig the other night where I was gripping hard, forcing fills, and generally was playing like crap. It was pointed out that it wasn't sounding good by the other guys on the gig. I made some adjustments by playing less and having a glass of wine and it sounded/felt good. The elusive idea of playing while relaxed in this very physical music takes some time to understand. Try to figure out what got you to that place. Ultimately, its bad form and body tension. But for me, it was usually trying to do stuff to increase my speed. I've basically stopped this stuff and ultimately stopped worrying about it as a result. Additionally, I've taken a few lessons and talked about this stuff with other players on multiple instruments. As Dave stated, its about self identification and making the proper adjustments.